Episode 4 of the How 2 Caravan Podcast is now live in the iTunes library ready to download to your listening device. You can also use the media player above to listen from your Internet browser. 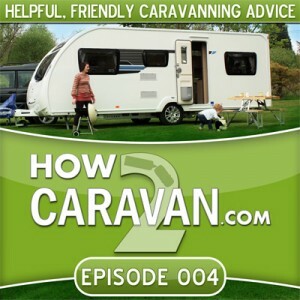 In this episode of the How 2 Caravan Podcast I am joined by author, Monica Rivron to talk about what she know best – cooking in a caravan. Monica wrote the “Caravan Cookbook” and shares her knowledge and expertise with us. I could not find the shelf made by Thule so I assume it was never put in to production. Monica has kindly donated 2 signed copies of her book that I will be giving to 2 lucky listeners. To enter the competition simply send me an email at josh@how2caravan.com (or fill in the contact form) with your name, telephone number and email address. The 2 winners will be drawn at random on 30th June 2014. For those of you who decide to purchase a copy of the Caravan Cookbook, Monica has prepared a special bonus recipe which I will send to you as a printable PDF document. Please email your proof of purchase receipt to josh@how2caravan.com and I will send you the bonus recipe. Once again, a very special thank you to Monica Rivron for taking the time out her day to join me on the show. It was an absolute pleasure to have you! Speak to you in the next episode folks.